Bagpiper - Silk-screened and hand finished plastic (PVC) figurine for Landi Moranduzzo Nativity Scene with 18th century Neapolitan period costumes. Landi Moranduzzo Logo printed on the base. Landi Moranduzzo nativy scene in silk-screened plastic (PVC) finished by hand. 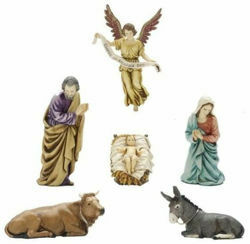 The Landi Moranduzzo handcrafted nativity scenes have been renowned worldwide for over 70 years. The statues are created by the sculptor Martino Landi, descendant of a family of artists and scholars of sacred art who have been sculpting figures for the crib for four generations. The figures are distinguished by the naturalness of their faces and expressions and for its traditional costumes, faithfully reproduced in the smallest details. The measure refers to the scale of the crib and not to the single statue. Each piece is hand painted, so photos may differ in some detail. Made in Italy. 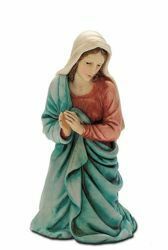 Mary / Madonna - Hand painted plastic (PVC) figurine for Landi Moranduzzo Nativity Scene in Arabic style. Inexpensive Handcrafted Italian Nativity scene in plastic PVC painted by hand. Exclusive work by sculptor Martino Landi. Logo Landi Moranduzzo printed on the base. Baby Jesus - Hand painted plastic (PVC) figurine for Landi Moranduzzo Nativity Scene in Arabic style. Saint Joseph - Hand painted plastic (PVC) figurine for Landi Moranduzzo Nativity Scene in Arabic style. Ox - Hand painted plastic (PVC) figurine for Landi Moranduzzo Nativity Scene in Arabic style. 4 Sheep, Goat and Dog Set - Hand painted plastic (PVC) figurines for Landi Moranduzzo Nativity Scene in Arabic style. Donkey - Hand painted plastic (PVC) figurine for Landi Moranduzzo Nativity Scene in Arabic style. Holy Family Set 3 pieces Lying Mary - Hand painted plastic (PVC) figurines for Landi Moranduzzo Nativity Scene in Arabic style. Holy Family Set 6 pieces - Hand painted plastic (PVC) figurines for Landi Moranduzzo Nativity Scene in Arabic style.